In my previous flat, I was a British Gas customer since 2013. I happily paid my bill by Direct Debit. As I’m disabled I never physically checked the meter. In Mid September 2016, I Received a huge bill. Turns out there was a cross meter situation in my old flat. Turns out it was all the flats we each had other people’s meters and were paying each other’s bills! British Gas won’t refund me the payments I’ve made on the wrong meter!! I’ve been in contact with www.ombudsman-services.org/sectors/energy After being impressed by their helpful attitude, however having the the report this was misguided and they are useless. On 22nd September 2016 I asked my landlord to confirm my meter reading. On 24th October 2016 they confirmed the reading, but the meter serial number they quote is different to what you (British Gas) quote. On 24th October 2016 I asked the Landlord to confirm the meter serial number. If wrong you’ve been billing me for the wrong meter for 5 years. Firstly I have no legal power over my landlord or the new tenants. Secondly, the ground floor residents of Rosing Apartments and myself are all vulnerable adults with a range of disabilities that may not allow for a power interruption. I myself am on your “priority fix” list due to my disabilities. What’s more annoying is page one of the bill dated 3rd August 2016 You (British Gas) say my account is fine and you’re not changing my payments! I’d say you failing in your duty to keep the customer informed. I was beginning to feel this was a lot of effort but 29th October 2016 I received a letter from Moorcroft Debt Recovery Limited – I realized you’re incompetent. I have been discussing this debt with you since September. I’ve said many times I can not conduct the “Burn Test” and have been ignored when giving my reasons – as above. If there is a mistake with the meter serial the compensation will have to be substantial to acknowledge the five-year mistake and the bullish attitude you’ve taken. If the serial Is correct you’re going to explain how I could use 7596 kWh of electricity. On 24th April 2017 After a very rude Customer Service Agent at British Gas, I switched my provider. After a quick google, I see this is a common tactic. Until you provide me with and accurate bill and explain the usage I will not be paying. Your welcome to take me to court. The final report from the Ombudsman is repetitive and incomplete! • credit the account with a £100 gesture of goodwill. If your supplier is at fault and has not sent you an accurate bill, they will not ask you to pay any extra for the energy you used (and for which you did not receive an accurate bill ) more than one year before they issued the bill. If we accept I’ve had an account since 2013 (i don’t) and if we accept i’ve been paying £21 a month. £21.00 * 96 = £2058 The amount I’ve potentially paid on the wrong meter. £21.00 * 12 = £252 The amount my Direct Debit has paid for the last year. That a difference of £1806. British Gas have offered < £30 as a refund. The “Back Billing Code (above)” says nothing about limits on refunds or ignoring payment made due to the error. The report also states 15035 on 1st September 2016 . Is the closing meter reading however it does not explain how a bill was generated from this. The Code also states… 3.5 Your supplier will make sure that they check unusually high or low bills before they send them out. 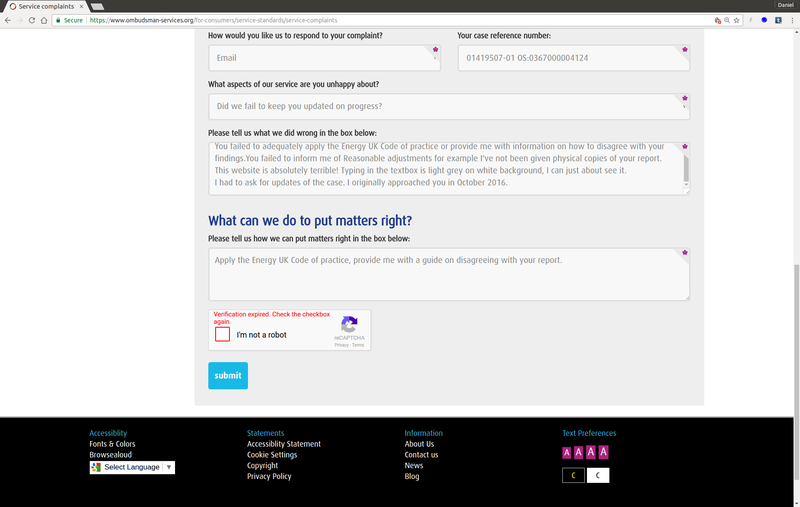 The instance of British Gas I perform the Burn Test despite telling them I was disabled. On 1st May 2017 I contacted the ombudsman (as above) so far I’ve had no acknowledge of my complaint, as such my assertion of them being useless stands. I attempted to call the 0800 number and was promptly cutoff by the automated system. So i’ve given up. On 1st May 2017 I contacted the ombudsman (as above) with the help of EHU the ombudsman responded. The person I was complaining about looked at the complaint! And surprise surprise found nothing wrong. Today I got Call Us 2017-05-17. I initially believed this was due to Leaving these cowboys and was the final bill for my current address. However it’s for BR2 9FN! Despite the several complaints, the Ombudsman and EHU being involved British Gas feel Harassing a disabled man is ok.
After a very unhelpful call with British Gas I was told several times I did not have an open complaint! Yet found it with the address, not the Customer Ref Number. When asked why I left British Gas, it’s due to this level of incompetence. My aim now is to go public. All correspondents will be published. 7. I have received an unusually high bill. What should I do? There are many reasons why your bill is higher than expected. Email 2017-6-07 from this we see. This matter has already been before the Energy Ombudsman, and you did not accept their decision. For the avoidance of doubt, back billing credit was already applied to the account in the amount of £620.17, leaving a small balance of ₤24.07 for you to pay. As per our earlier telephone conversation, I confirm I wrote off that amount as a gesture of goodwill leaving the account with a nil balance. So the ₤24.07 has been written off. We also see they have provided a bill detailing how this ₤24.07 was reached. The reading of 15035 would have been from the wrong meter serial number. It appears on the bill dateed 22nd September 2016 so must be from when the meters where crossed. So this bill has not been referred to the Energy Ombudsman. 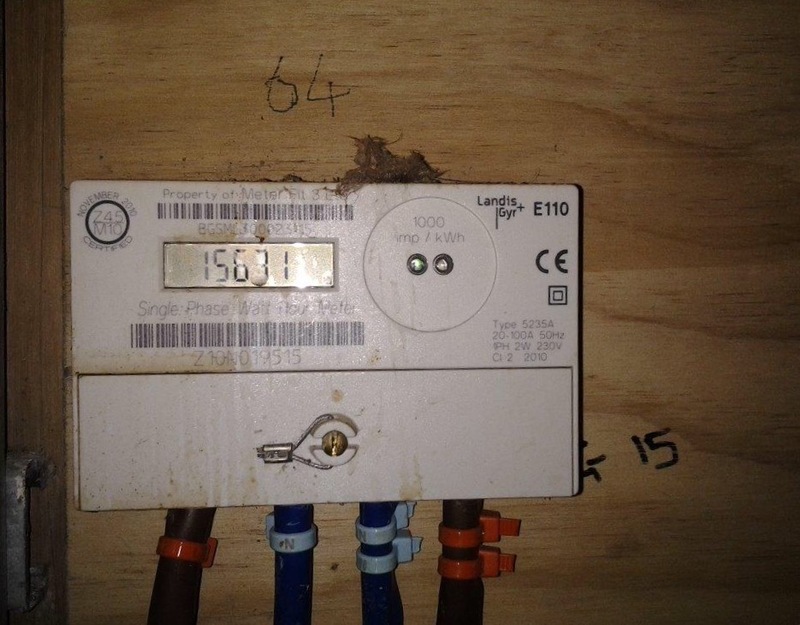 The crossed meter issue has been investigated by the Energy Ombudsman this bill produced on 27th April 2017 has not been looked at by The Energy Ombudsman and Citizen Advice Extra Help Unit. The Back Billing Code was applied to my account and the bill of 27th April 2017 was the result. This Bill resulted in a £24 debt on the Account. British Gas have written off this debt. Now 15035 is the same final reading you gave on both bills. I did not approach British Gas about the possible cross meter until I received the bill dated 22nd September 2016. So they are using the wrong meter reading again. You have never explained where 15035 came from and why it’s on both bills. British Gas are refusing to Engage on this say I need to ask the Ombudsman or seek private legal help. As a disabled man on benefits, legal action is so far out my reach it’s funny.